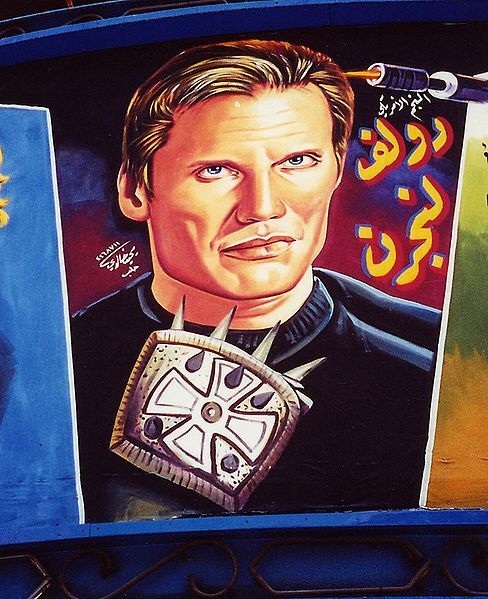 In case any of you are feeling frisky and/or testy in the comments section, we’ve found Post Academic’s enforcer and bouncer–introducing, Dolph Lundgren! We mention this, because Lundgren has been making the rounds promoting the really-bad-idea of a blockbuster, The Expendables. You know, it’s the movie that stars the washed-up action heroes of our youth, including, somehow, the sitting governor of a state that basically has no budget to fund its public colleges and universities. (Working hard, huh, Governator?) Don’t know whose idea The Expendables was, but Lundgren is probably the only one bright enough to realize it’s a bad one. My favorite line is how Stallone calls him a “full scholar,” like he’s trying to remember the term Fulbright, but just quite can’t. And it seems like Dolph really is some kind of renaissance man: in addition to being kind of a post academic and the archetypal ’80s fake-Russian villain, Lundgren knows a ton of languages (besides his native Swedish, English, and bad movie dialogue), served in some kind elite military service, is a martial arts expert, and was the Team Leader/coordinator of the 1996 U.S. Olympic Pentathlon Team. So for you post-grads and soon-to-be-Ph.D.s on the fence about what to do next, but are ambivalent about hanging on as academics, you could do worse than to ask yourself “What Would Dolph Do” when you’re in a pinch. The next time you think about the academic job market, just imagine it in the place of Rocky Balboa as you utter Drago’s immortal lines to yourself: “I must break you.” That, or wax philosophical by telling yourself, “If he dies, he dies,” as you’re waiting for the campus visit phone call that’s never coming. Talk about expendable!